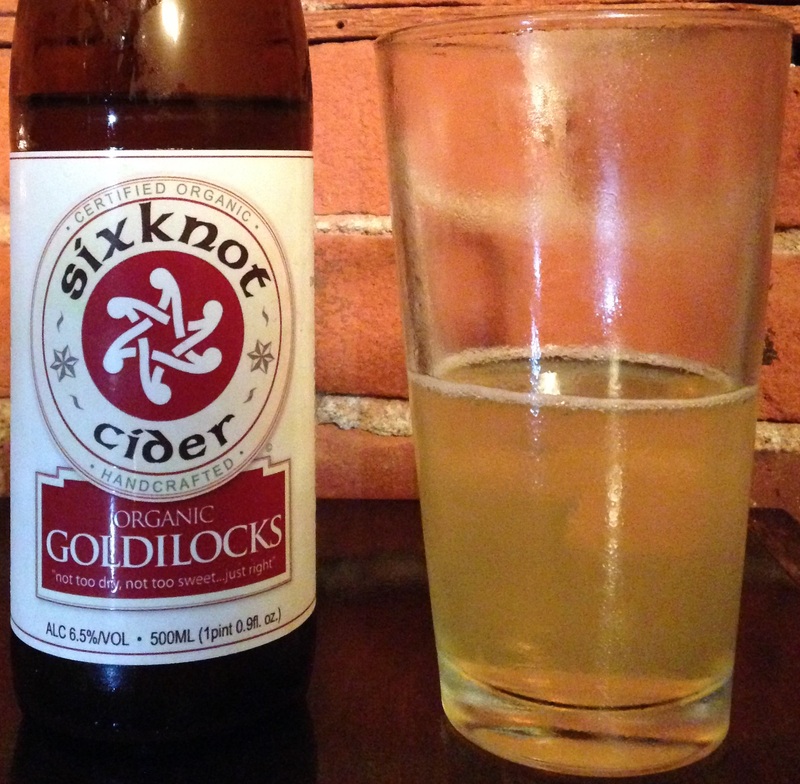 Review of Organic Goldilocks from Sixknot Cider. Cider Description: Goldilocks is made by arresting the fermentation process with cold shock prior to complete transformation of the natural sugars to alcohol. This process delivers a refreshing, elegant cider that is easy for the first time cider drinker to embrace, and still provides complexity for the experienced palate. 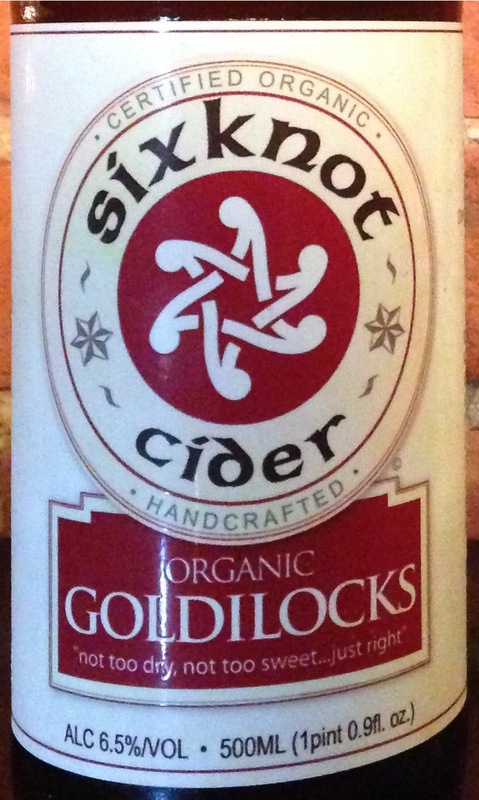 As the name implies, Goldilocks is not too sweet or too dry, it is a true balanced cider. The cider is naturally effervescent. 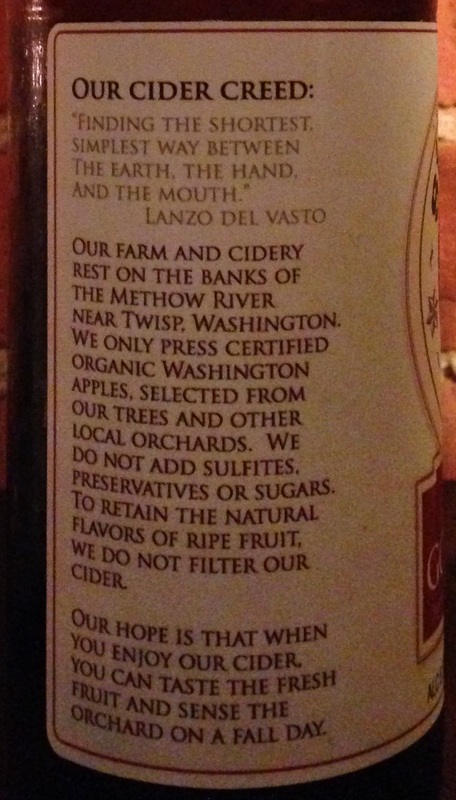 Cidery Description: Our farm and cidery rests on the banks of the Methow River near Twisp, Washington. We only press certified organic Washington apples, selected from our trees and other local orchards. We do not add sulfites, preservatives or sugars. To retain the subtle flavors often lost in processed ciders, we do not filter. Our cidermaking is kith and kin to the natural wine movement…organic practice in the orchard, and minimal intervention in the ciderhouse. They sell three core bottled ciders, Goldilocks, High Desert Dry, and Gingerella. They also have special releases (such as Purple Sage), and their ciders can be found on draft. Where Drank: The Repp in Snohomish WA. This is their only cider selection, and it isn’t even on the menu (I was glad I asked if they had cider the last time I was in). The only other time I’ve had this cider was also there. Its a great restaurant by the way, with good variety on the menu and reasonable prices for finer dining. There is also Fred’s down the street, a unique bar with a huge Scotch collection and a few ciders (where I had Woodchuck Raspberry). How Found: I’d heard of Sixknot, but tried it mostly as that is what was available. First Impression: I was still getting over being asked if I wanted ice with my cider! After that, I noticed the lovely hazy lemonade color with light carbonation & foam. Clean acidic apple scent. Opinion: Semi-dry. Mild tartness and tannins. Moderate acidity. Some earthiness and the slightest bit of funk. Mild citrus notes. Very apple-forward. I enjoy unfiltered ciders. Some folks however consider haziness a flaw. I’ve heard that overly filtering can take out some of the flavors. This is a rather flavorful cider for being a flagship type variety, and I enjoyed it. I think this variety would be pretty widely appealing, although some would probably like a bit more sweetness. This was advertised as middle of the road sweetness but I found it a bit drier than that. Closing Notes: Quite tasty. It was great to be able to enjoy some local craft cider at a local restaurant for our anniversary. I had seafood pasta and my husband had red wine and a steak. This wasn’t the greatest cider to pair with seafood pasta (I’d go for something a bit richer), but I was happy to have cider at all. Oddly enough, even being in a huge producing cider area, lots of restaurants in my area still don’t have cider, or only Angry Orchard Crisp Apple. Going to a non-chain restaurant increases the odds. 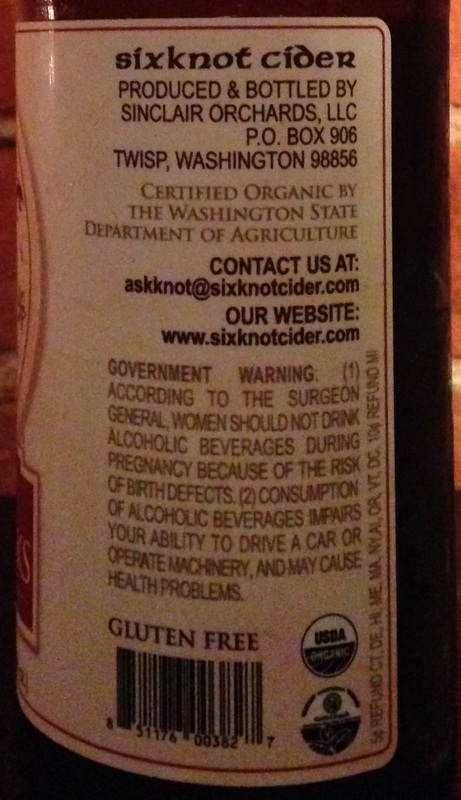 Note that I’ve had another cider from apples grown in the same Methow Valley region, Methow Valley Honey Bear, but it was quite a different style & level of sweetness. Have you tried Sixknot Goldilocks? What did you think?